So you want to be a Domainer? 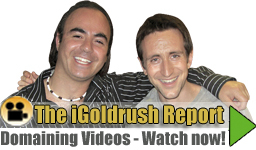 iGoldRush Domain News and Resources > Random Domaining > Audio & Video > So you want to be a Domainer? A comical animated video that captures a conversation between two characters, Tom and Frank, where Tom is excited to jump into domaining and is looking for quick easy money, but experienced domainer Frank sets him straight. Check out this video to have a laugh, and learn something too!